Barack Obama threw down the gauntlet to Republicans, demanding they “stop the political circus” and back a new $447 billion (Â£280 billion) jobs plan to help revive the “stalled” American economy. The White House had briefed beforehand that the jobs package, to be called the American Jobs Act, would cost more than $300 billion. But Obama administration sources disclosed just before the address that the figure would be well over $400 million. The centrepiece of the plan was a deeper than expected $240 billion payroll tax cut for employers and employees meant to keep money in the pockets of those most in need. The plan’s $447 billion price tag contains $175 billion to cut employee payroll taxes in half, to 3.1 percent in 2012. Denying that the speech was “political grandstanding”, he sought to shame Republican into action. “The people of this country work hard to meet their responsibilities. The question tonight is whether we’ll meet ours. Mr Obama, who was at times impassioned as he implored Congress to take action, said the Act, while not the “silver bullet” Americans were searching for, it would put people back to work and more money in the pockets of those who are working. “It will create more jobs for construction workers, more jobs for teachers, more jobs for veterans, and more jobs for the long-term unemployed,” he said. “It will provide a tax break for companies who hire new workers, and it will cut payroll taxes in half for every working American and every small business. Mr Obama used the grand backdrop of the House chamber in a rare address to a Joint Session of Congress for what was essentially an attempt to re-launch his faltering presidency. It could be his last realistic chance to speed up growth and start to bring down unemployment, which is stuck stubbornly at 9.1 percent. On the line were his prospects of winning a second term, which look shakier with each opinion poll. Chances of the plan being passed by Congress are remote, however, with Republicans united in their opposition to any new spending not balanced by steep budget cuts. A deeply polarised political climate means many Republicans are reluctant to do anything that could help Mr Obama politically. 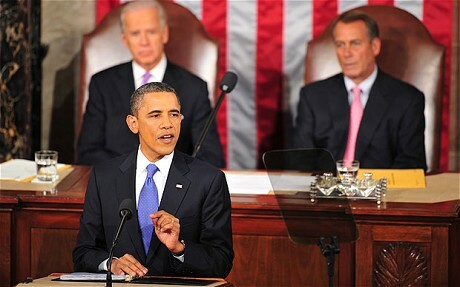 There was due to be no bipartisan seating for Mr Obama’s speech as there was at the State of the Union in January. At least five Republicans, two senators and three representatives, said they planned to boycott it because they had better things to do. John Boehnre, the Speaker of the House rebuked those boycotting Mr Obama, saying that “we ought to be respectful, we ought to welcome him”. He said that he hoped for “common ground” with the president but did not say if he would back the plan.